Pope Kyrillos VI was born on August 2, 1902 and was called Azer Ata. His father Ata, was a church deacon and belonged to a middle class family. After completing high school, Azer went to work for a shipping company in Alexandria. Azer was content with little food and the ground to sleep on. Then much against his family's wishes, he resigned his job with the intention of becoming a monk and entered the Monastery of El-Baramous on July 27, 1927. He was ordained monk on February 25, 1928 and was named Mina after the name of Saint Mina (Menas or Mena), his patron saint. He was ordained priest on July 18, 1931. He also attended the Helwan Theological College and was rated one of the top students. 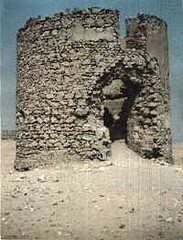 --- When the monastery of Saint Samuel was restored, he left that area and moved to a deserted windmill in El-Moukatam mountain at the outskirts of Cairo (see figure down). This windmill was totally abandoned and very dangerous. It was miles from the nearest city. Many dangerous animals can be found there at all times, like scorpions and snakes. Here, Father Mina spent his time praying and contemplating because of his love for his Saviour. Satan sent robbers to the windmill. The robbers beat Father Mina and injured his head. When Father Mina regained consciousness, he noticed he was bleeding. He crawled to the icon of Saint Mina and put the icon on his head. The bleeding stopped at once. Father Mina then went to the hospital to be treated. The doctors were surprised when they found out that he walked 15 miles from the windmill. ---One might ask why does it matter if Pope Kyrillos performed miracles. In fact some have asserted, as the Pharisees did, that miracles are the work of the devil. But we have seen otherwise. The miracles of Pope Kyrillos helped strengthening people's faith and they returned to God. Unveiling people's secrets often leads them to faith and changes their presumptuous thoughts, as it did with Nathanael (John 1:45). Nathanael had changed from a doubter who said, "Can anything good come out of Nazareth?" to a believer saying, "Rabbi, You are the Son of God." The gift of revelation leads to repentance. The Samaritan woman began her discussion with Jesus with contempt. But because Jesus revealed her thoughts, she said to everyone, "Come, see a man who told me all things that I ever did." (John 4:29). It is said that Pope Kyrillos VI prayed more than 12,000 masses during his lifetime. He would start the day spiritually at 3:00 or 4:00 am with the Holy Psalmody and finish the liturgy early so that many of his children can go to school and work. This continued for thirty five years ever since the pope was a hermit. The mass service was the source of his strength and greatness. Didn't the Lord say: "I love them that love me; and those that seek me early shall find me." (Proverbs 8:17 - KJV). The Psalmist also said: "I rise before the dawning of the morning, and cry for help; I hope in Your word. My eyes are awake through the night watches, that I may meditate on Your word." ( Psalms 119:147-148 - NKJV). --One day Pope Kyrillos received a foreign priest in his private room at the old Cathedral of Saint Mark. The priest, seeing that the room of His Holiness was very humble and not to the standard a pope deserves, asked His Holiness to give him the permission to furnish the room and decorate it with the most luxurious furniture. The Pope laughed and thanked him for his love, saying: "The room in its current state is still much better than the manger where the Christ was born." In his first papal letter, Pope Kyrillos said: "Let us disappear for God to appear with His blessed glory." It was under the papacy of Pope Kyrillos VI that this dream came true, a few months after the start of the miraculous apparitions of the Blessed Virgin Mary at Zeitoun, Egypt. From the time Pope Kyrillos stepped off the plane which brought the holy relics (see figure on the right -- photographed on June 24, 1968), hymns, liturgies and doxologies were sung incessantly. Luminous celestial beings in the shape of white pigeons flew over Cairo Airport and were seen by all attendants (it was half an hour before midnight and real pigeons do not fly by night). These beings were similar to the 'doves' that accompanied the apparitions of the Blessed Virgin Mary at Zeitoun; they appeared suddenly and also disappeared suddenly. The body of Saint Mark was finally placed in the new Cathedral of Saint Mark. In his last days on our vanishing earth, he was gravely ill with phlebitis. They hooked a speaker from the great Cathedral to his bedroom at his request because he could not bear not being able to perform liturgy daily as before. One day the head mother of one of the convents (monasteries for nuns) wanted to speak to him on the phone, but the staff wouldn't give out his private number. Anba Kyrillos appeared to her in a vision, gave her the number and comforted her. She did not call, but later on she was blessed by seeing him and was rendered speechless when Anba Kyrillos asked her the reason she did not call on his private line. Our Father Papa Ava Kyrillos departed on March 9, 1971. Initially, they buried him under the Altar in the Great Cathedral in Cairo. But when his successor, H.H. Pope Shenouda III read his will, he had to follow his wishes and move his holy body to the desert south west of Alexandria, to the Monastery of Saint Mina which was re-established and immensely expanded by Pope Kyrillos to honour his patron saint, St. Mina of Mariout. May the prayers and intercessions of the Blessed Virgin Mary, Mother of God, and of Pope Saint Kyrillos VI and his patron Saint, St. Mina the martyr and miracle-maker of Mariout be with us. Glory be to God forever. Do not sorrow, for the joy of the LORD is your strength. 430710405/&quot;&gt;<img src="http://farm1.static.flickr.com/187/430710405_6bb36af668_m.jpg" width="179" height="240" alt="cyril62" /> On March 9, the Coptic Orthodox Church remembers the departure of the Great Pope (Papa, Ava) Kyrillos (Cyril) VI, the 116th Pope of Alexandria and successor of Saint Mark the Evangelist. He sat on the throne of Saint Mark for twelve years (1959-1971). Pope Kyrillos was a holy man of prayer who through full dedication to the life of prayer and fasting possessed many higher gifts which included performing wonders and miracles, the gift of knowledge, and an unusual ability to lead by example. He was undoubtedly a very spiritual man and brought the Coptic Church into a new era of spirituality. He was highly regarded by the people of Egypt from all walks of life, Christians and non-Christians alike. Pope Kyrillos VI was born on August 2, 1902 and was called Azer Ata. His father Ata, was a church deacon and belonged to a middle class family. After completing high school, Azer went to work for a shipping company in Alexandria. Azer was content with little food and the ground to sleep on. Then much against his family's wishes, he resigned his job with the intention of becoming a monk and entered the Monastery of El-Baramous on July 27, 1927. He was ordained monk on February 25, 1928 and was named Mina after the name of Saint Mina (Menas or Mena), his patron saint. He was ordained priest on July 18, 1931. He also attended the Helwan Theological College and was rated one of the top students. Father Mina's love for God was so great that he desired a life of solitude. Only thirty years old at the time, the monks refused his request saying, &quot;You are only thirty years old and your monastic life is only five years. Do you want to pursue the life of solitude in the desert whereas many others before you have struggled for the same goal for thirty or forty years and failed?&quot; The assembly of monks did not change Father Mina's decision and he lived in a cave near the monastery. He pursued a life of solitude at El-Natron Valley in the western desert between Cairo and Alexandria, then he headed the Monastery of Saint Anba Samuel the Confessor at Zawarah in upper Egypt and devoted a great deal of effort toward the restoration of this historic landmark. --- When the monastery of Saint Samuel was restored, he left that area and moved to a deserted windmill in El-Moukatam mountain at the outskirts of Cairo (see figure down). This windmill was totally abandoned and very dangerous. It was miles from the nearest city. Many dangerous animals can be found there at all times, like scorpions and snakes. Here, Father Mina spent his time praying and contemplating because of his love for his Saviour. <a href="http://www.flickr.com/photos/jabez-/430723471/"><img src="http://farm1.static.flickr.com/154/430723471_be94894de4_m.jpg" width="183" height="240" alt="windmill" /></a> It goes without saying that Father Mina had many obstacles to overcome which Satan setup. First Satan instigated the guard of Antiquities not to carry water to the monk. Afterward, God sent one of his saints in a dream to rebuke the guard. So he woke up and carried water to Father Mina who was in urgent need for it. In another incident Satan sent robbers to the windmill. The robbers beat Father Mina and injured his head. When Father Mina regained consciousness, he noticed he was bleeding. He crawled to the icon of Saint Mina and put the icon on his head. The bleeding stopped at once. Father Mina then went to the hospital to be treated. The doctors were surprised when they found out that he walked 15 miles from the windmill. Father Mina was ordained Pope on Sunday May 10, 1959 and was named Kyrillos VI. Before him, five popes of Alexandria bore the name Kyrillos (Cyril); the first of them was Saint Cyril the Great of Alexandria, the pillar of faith, who acted against Nestorianism and used the title Theotokos, meaning God bearer, or Mother of God, for the Virgin Mary. On the enthronement day of our holy father, Pope Kyrillos VI declared that by becoming the pastor, he was also the loving and vigilant pastor of all. At the end of the liturgy, all people gathered around him and he began to bless them individually, standing for long hours with meekness and patience. The metropolitans and bishops felt pity for him after noticing the sweat and his fatigue. They beseeched him to rest. But the pope refused to send anybody away and insisted on finishing. From then on, Pope Kyrillos continued this practice. The pope abolished any barrier between him and his sons. As a result, one could meet the pope whenever in need, even if he was sick or even if one came by night while everybody else slept. When he was asleep, his patron saint, Saint Mina, would awaken him. Once, as Father Raphael Ava Mina says, someone went to Pope Kyrillos to pray for him because all medical effort to heal him had failed. But the Pope was asleep so the person was about to go home. But Saint Mina awakened the Pope to give him his blessings. The man was surprised to find the pope calling him by his name even though he had never seen him before. <b> The amount of documented miracles performed by Pope Kyrillos and his patron saint, St. Mina, is immense. It is said that nearly every person who lived in the days of Pope Kyrillos witnessed a personal miracle, whether healing from various diseases, miraculous solving of difficult life problems, casting out of devils or just revelation of people's past. And till our present day, Pope Kyrillos performs miracles which are documented. There are more than 18 printed volumes documenting the miracles of Pope Kyrillos. Originally published in Arabic by 'Pope Kyrillos the VI Society', many of these volumes were also translated to English, French and other languages. </b> ---One might ask why does it matter if Pope Kyrillos performed miracles. In fact some have asserted, as the Pharisees did, that miracles are the work of the devil. But we have seen otherwise. The miracles of Pope Kyrillos helped strengthening people's faith and they returned to God. Unveiling people's secrets often leads them to faith and changes their presumptuous thoughts, as it did with Nathanael (John 1:45). Nathanael had changed from a doubter who said, &quot;Can anything good come out of Nazareth?&quot; to a believer saying, &quot;Rabbi, You are the Son of God.&quot; The gift of revelation leads to repentance. The Samaritan woman began her discussion with Jesus with contempt. But because Jesus revealed her thoughts, she said to everyone, &quot;Come, see a man who told me all things that I ever did.&quot; (John 4:29). It is said that Pope Kyrillos VI prayed more than 12,000 masses during his lifetime. He would start the day spiritually at 3:00 or 4:00 am with the Holy Psalmody and finish the liturgy early so that many of his children can go to school and work. This continued for thirty five years ever since the pope was a hermit. The mass service was the source of his strength and greatness. Didn't the Lord say: &quot;I love them that love me; and those that seek me early shall find me.&quot; (Proverbs 8:17 - KJV). The Psalmist also said: &quot;I rise before the dawning of the morning, and cry for help; I hope in Your word. My eyes are awake through the night watches, that I may meditate on Your word.&quot; ( Psalms 119:147-148 - NKJV). The late Bishop Mina El-Samueli spent a few years of his monastic life with Father Mina. He recalled this story. He said, &quot;Father Mina the Hermit used to wake up at 2:00 am, start the midnight Agpeya prayers, bake the 'korban', raise incense then serve the holy mass which would end around 8:00 am. This meant spending six continuous hours in prayer. Afterwards, he would meet with those who were hungry and thirsty for God's mercy. Here is a sick person looking for a cure which he attains through the prayers of Father Mina. There is another facing a major decision in need of God's guidance and obtains it through Father Mina's advice. A third is tormented by a demon and is healed when Father Mina prays for him... Whoever sat with Father Mina obtained a definite relief, a heavenly relief. So one would leave knowing that his ship had found a true haven and his soul was filled with peace.&quot; --One day Pope Kyrillos received a foreign priest in his private room at the old Cathedral of Saint Mark. The priest, seeing that the room of His Holiness was very humble and not to the standard a pope deserves, asked His Holiness to give him the permission to furnish the room and decorate it with the most luxurious furniture. The Pope laughed and thanked him for his love, saying: &quot;The room in its current state is still much better than the manger where the Christ was born.&quot; In his first papal letter, Pope Kyrillos said: &quot;Let us disappear for God to appear with His blessed glory.&quot; <b> He restored the body (relics) of Saint Mark from Italy. Saint Mark, who wrote the Gospel bearing his name, is the founder of the Coptic Church. After his martyrdom in Alexandria in 68 A.D., his body was kept in Egypt but eventually ended up in Rome. For many centuries, the Coptic Orthodox Church wanted the relics of her patron saint back. <a href="http://www.flickr.com/photos/jabez-/430710408/"><img src="http://farm1.static.flickr.com/165/430710408_a816fbf233_m.jpg" width="187" height="240" alt="cyril63" /></a> It was under the papacy of Pope Kyrillos VI that this dream came true, a few months after the start of the miraculous apparitions of the Blessed Virgin Mary at Zeitoun, Egypt. 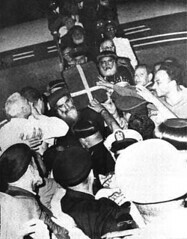 From the time Pope Kyrillos stepped off the plane which brought the holy relics (see figure on the right -- photographed on June 24, 1968), hymns, liturgies and doxologies were sung incessantly. Luminous celestial beings in the shape of white pigeons flew over Cairo Airport and were seen by all attendants (it was half an hour before midnight and real pigeons do not fly by night). These beings were similar to the 'doves' that accompanied the apparitions of the Blessed Virgin Mary at Zeitoun; they appeared suddenly and also disappeared suddenly. The body of Saint Mark was finally placed in the new Cathedral of Saint Mark. </b> In his last days on our vanishing earth, he was gravely ill with phlebitis. They hooked a speaker from the great Cathedral to his bedroom at his request because he could not bear not being able to perform liturgy daily as before. One day the head mother of one of the convents (monasteries for nuns) wanted to speak to him on the phone, but the staff wouldn't give out his private number. Anba Kyrillos appeared to her in a vision, gave her the number and comforted her. She did not call, but later on she was blessed by seeing him and was rendered speechless when Anba Kyrillos asked her the reason she did not call on his private line. Our Father Papa Ava Kyrillos departed on March 9, 1971. Initially, they buried him under the Altar in the Great Cathedral in Cairo. But when his successor, H.H. Pope Shenouda III read his will, he had to follow his wishes and move his holy body to the desert south west of Alexandria, to the Monastery of Saint Mina which was re-established and immensely expanded by Pope Kyrillos to honour his patron saint, St. Mina of Mariout. <b> May the prayers and intercessions of the Blessed Virgin Mary, Mother of God, and of Pope Saint Kyrillos VI and his patron Saint, St. Mina the martyr and miracle-maker of Mariout be with us. Glory be to God forever. Amen</b> <i> Do not sorrow, for the joy of the LORD is your strength. (Nehemiah 8:10 - NKJV) </i> Please pray for my weakness InChrist Jabez.